How do I change the way students see assignment scores in the gradebook? Echo allows teachers to chose how assignment scores will be displayed in the gradebook. The gradebook score column can display points, percent, letter grade, and even minutes spent on the assignment. 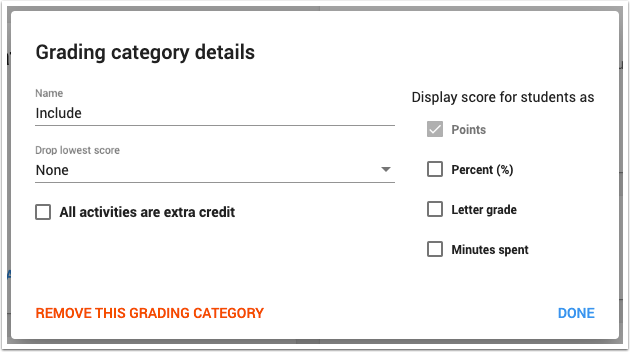 NOTE FOR MOS GRADEBOOK USERS: Even though Echo doesn't use traditional grading categories once the MOS Gradebook is enabled, it is still where this setting is configured. The panel typically contains default categories (usually "include" and "exclude"). Assignments are automatically assigned to the first category. 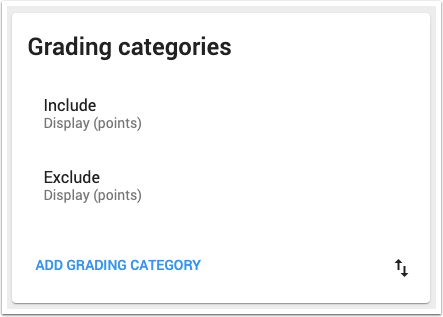 To adjust the way assignment scores are displayed in the gradebook, navigate to the course settings page and locate the Grading Categories panel. Click the category title to edit and save the score display settings.